In the leafy suburbs of South Belfast, discover one of the Northern Irelands finest four star hotels. The centrepiece of a beautiful Victorian terrace, the Malone Lodge Hotel is an oasis of clam and quiet elegance. Take time to sink into one of the many sofas in our spacious two tiered lobby. Furnished in gentle tones of gold and royal blue, this is the perfect place for a soothing cappuccino or informal business chat. The friendliness of the Malone Lodge Hotel is legendary and after a long stressful business day, you will experience the contentment that comes with a warm welcome from staff who are genuinely pleased to see you. All bedrooms have been designed with your comfort in mind and furnished to the highest specification. Soft rust and bronze tones contrast with cream and contemporary charcoals to create a well haven of relaxation. All include big comfortable bed, most have high powered showers and computer modem points. Macklins Bar with all the richness that mahogany, polished granite and black leather brings. Macklins Bar has the atmosphere and ideal place to meet colleagues and friends for lunch or dinner or stop for a early evening cocktail. Savour the delights of The Green Door Restaurant where you will experience culinary skills unparalleled in Northern Ireland. Relish contemporary dishes, all superbly presented, which incorporate the best of local organic fresh produce. When it comes to meetings, conferences and banqueting, we really mean business. Computerised lighting and air control systems, state of the art sound proofing and all the business support you will need. Ideal for banquets ranging from 50 to 150 guests and more intimate meetings in out boardroom which is perfect for up to 25 delegates. 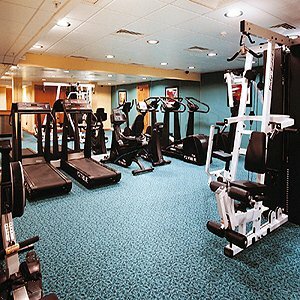 The hotel also provides complimentary car parking and fitness suite and sauna. 1 Nights Deposit Required For Apartment Bookings. Zen Upmarket Special Occasion, fine dining Asian style food restaurant, renowned in Belfast for its great food and stylish atmosphere. Cayeene Fine dining restaurant owned by Celebrity chef Paul Rankin. Up market, fine European food. Mogul Busy very popular Indian Restaurant. Tedfords Specialises in excellent seafood style restaurant. La Tasca Very busy Spanish/Tapas restaurant located in the Odyssey, ideally situated for Concerts, Night Clubs, cinemas and Bars. Caf&eacute; Milano Busy Stylish Italian restaurant ideally situated in walking distance from the Malone Lodge hotel. Saclini Busy very popular Italian restaurant located in a very busy night club and bars area. Shu Upmarket, special occasion, fine dining restaurant located with walking distance of Malone Lodge Hotel. Deans Brasserie Fine dining very popular restaurant owned by celebrity chef Michael Dean. Bowness Suite Dimensions Length - 18 metres Width - 9 metres Height - 3 metres Maximum Theatre Style Capacity - 150 Maximum Classroom Style Capacity - 100 Maximum 'U' Shaped Style Capacity - 70 Maximum Boardroom Style Capacity - 70 Maximum Cocktail Style Capacity - 150 Maximum Banquet Style Capacity - 120 Maximum Dinner - Dance Style Capacity - 120 The room does have windows with natural daylight that can be effectively blacked out. The Bowness Suite is suitable for small to large conferences up to 150 delegates, 120 banquet style and an ideal suite for weddings. Computerised lighting, air control systems and state of the art sound proofing. Keswick Dimensions Length - 11 metres Width - 6 metres Height - 3 metres Maximum Theatre Style Capacity - 50 Maximum Classroom Style Capacity - 25 Maximum 'U' Shaped Style Capacity - 25 Maximum Boardroom Style Capacity - 25 Maximum Cocktail Style Capacity - 45 Maximum Banquet Style Capacity - 40 The room does have windows with natural daylight that can be effectively blacked out. The Keswick Suite is suitable for conferences up to 50 delegates' theatre style, 25 boardroom style and 40 banquet style. This room also has computerised lighting and air control systems, state of the art sound proofing. Boardroom Dimensions Length - 8 metres Width - 5 metres Height - 3 metres Maximum Theatre Style Capacity - 30 Maximum Classroom Style Capacity - 20 Maximum 'U' Shaped Style Capacity - 20 Maximum Boardroom Style Capacity - 25 Maximum Cocktail Style Capacity - 30 Maximum Banquet Style Capacity - 25 The room does not have windows with natural daylight that can not be effectively blacked out. This beautifully decorated room is perfect for boardroom meetings up to 25 delegates and ideal for private dinners up to 25 guests although this room has no natural lighting it has good computerised lighting and air conditioning. Study Maximum Theatre Style Capacity - 15 Maximum Classroom Style Capacity - 6 Maximum 'U' Shaped Style Capacity - 10 Maximum Boardroom Style Capacity - 12 Maximum Cocktail Style Capacity - 15 Maximum Banquet Style Capacity - 15 The room does have windows with natural daylight that can be effectively blacked out. The beautifully decorated room has all the original features of a Victorian terrace with an outstanding fireplace as its main feature. This room is perfect for management/boardroom meetings for up to 12 delegates.